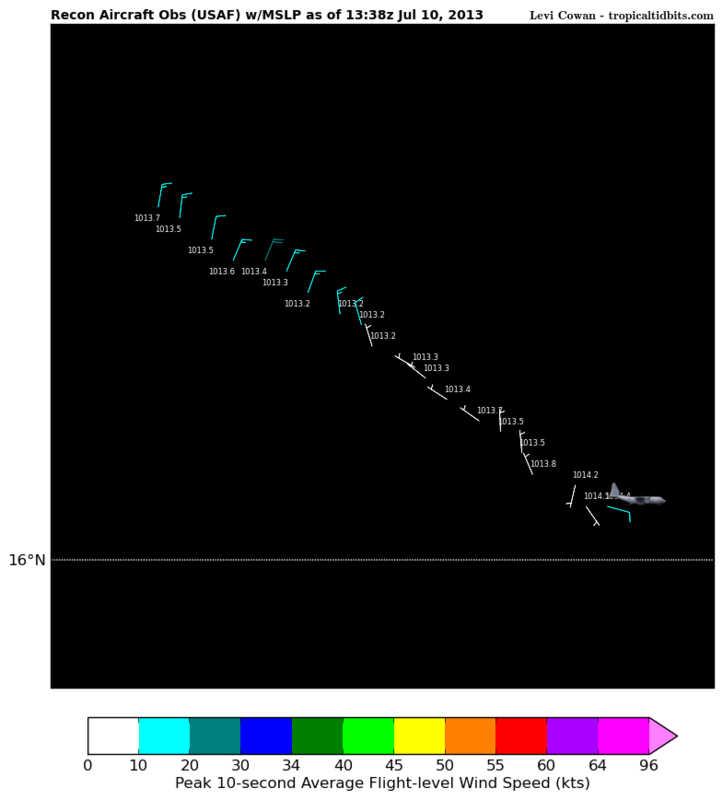 The recon aircraft did find a wind shift in Chantal that indicates she has retained a very weak surface circulation. Pressures were high near 1013mb, indicating that she has weakened significantly. Thunderstorms are going back up over this center, so heavy rainfall will still impact Hispaniola today. As Chantal gets farther west and north her chances for restrengthening will increase in the NW Caribbean and perhaps the eastern Gulf of Mexico as she leaves the fast trade wind flow of the Caribbean which has nearly killed her, but a potential encounter with Cuba could also kill her forever. While Chantal has ceased to be an immediate significant threat, interests in the NW Caribbean from Jamaica to Cuba and Florida should monitor Chantal’s progress in case of restrengthening. In a striking turn of events, Chantal lost all of her thunderstorms for a few hours overnight, and although some are redeveloping this morning, this episode was enough for Chantal to lose her surface circulation, and she is likely an open wave. A recon aircraft is currently investigating whether this is the case, though airspace restrictions may prevent them from confirming it. Regardless, the unfavorable trade wind flow that we have expected to cause Chantal to struggle has done much more to her than anticipated, and Chantal may never recover. As a result, her low-level center is tracking with the low-level wind flow on a trajectory much farther to the west and south, and most of Chantal will now avoid Hispaniola, though heavy rain will still impact the island with possible flooding. Chantal’s future suggests a track towards Cuba and perhaps the Florida Peninsula. She potentially may have to be watched for redevelopment in the eastern Gulf of Mexico in a few days, but for now has ceased to be an immediate threat except for heavy rainfall. We are essentially no longer tracking a tropical cyclone, but instead tracking a tropical wave that may have a chance to develop in a few days. I will have a full update this evening after work. Chantal remains ragged in appearance on satellite imagery this evening with little convective organization. Most of the new thunderstorm development in recent hours is associated with outflow boundaries racing out ahead of the storm, with little vertical motion over the center of circulation which is obscured by the cirrus canopy. Upper-level outflow is non-existent on the north and west sides. Despite being disorganized, Chantal’s wind speeds increased again today, and are now 65mph based on recon data. This may be in part due to an already strong pressure gradient on the northern side of the storm, exacerbated by thunderstorms. Chantal continues to race towards the WNW at 26 mph, a speed that will continue to hinder her development. Little change in strength is expected prior to reaching Hispaniola in about 24 hours. The crossing of the Hispaniola and Cuban mountains will significantly disrupt the circulation, and still has the potential to destroy Chantal entirely. If this occurs, Chantal will move into the Bahamas as a remnant wave. However, based on numerical model guidance supporting deepening after clearing Hispaniola, and the forecasted presence of a strong low-level jet converging into the system from the SE at that time, this forecast assumes Chantal will survive. Wind shear is expected to increase in association with an upper trough as Chantal leaves Hispaniola, but will lighten as a cut-off low forms over the SE US and backs away from the system. The developing col pattern in the upper levels will be conducive for restrengthening of Chantal as she approaches the SE US. Chantal is racing WNW along the southern periphery of a subtropical ridge, and this general motion will continue for the next 12-24 hours. A building meridional ridge axis following behind Chantal is expected to help push her more towards the NW over Hispaniola as the western flank of the subtropical ridge is being eroded by an upper low over Florida. There exists potential for serious flooding in Hispaniola as the Caribbean LLJ rides upslope into the mountains on the eastern side of Chantal. It is at this point that any pull by the mountains or reformation of Chantal’s center could shift the exact forecast track in an unpredictable way, and interests in eastern Cuba and the Bahamas should be aware of this. A general NW to NNW motion is expected to bring Chantal near the northern Bahamas by Days 3 and 4, with a substantial decrease in forward speed as steering currents weaken in the face of a trough split over the SE US. The upper low resulting from this split will back westward over the north gulf coast, and ridging building north of Chantal in its wake will bend her back towards the NW or WNW towards the SE US coastline by Day 5. The forecast track is on the southern edge of the model guidance envelop through 24 hours, and on the right-hand side of the guidance envelope thereafter. Again, potentially unpredictable interactions with Hispaniola could shift the forecast track of Chantal during the next 2 days, and interests in Hispaniola, eastern Cuba, the Bahamas, and the SE US should monitor Chantal closely.